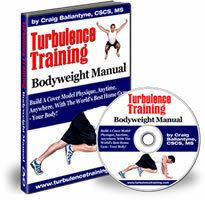 Your fat loss journey is the take away theme in Turbulence Training Day 19. Home fitness workouts that'll burn fat and sculpt your body in 4 weeks. Welcome to day 19 of Turbulence Training's Buff Dudes and Hot Chicks fat burning workout. "Hey there I'm Asad from Better4Fitness.com, and today's day 19 of the Buff Dudes and Hot Chicks workout. Hope you're doing well, I certainly am today - I've got my 'monkey business' t-shirt on, so that means I mean business =) and today was a business day with the workout (fat loss journey). It was the best Friday yet, which is a really good feeling because I've been struggling with workout C, the Friday workouts. But I really smashed it up today, it was really good. Having said that, the bodyweight intervals are still tough, they're never gonna be easy, so that's something to bear in mine when you do this workout. It's gonna be tough, but as long as you keep making progress and keep ploughing on and keep doing better than you did last week, then you'll see improvements and you'll feel more motivated to go on, and you'll feel much happier afterwards. So stay tuned for today's workout, it's a good one today, I hope you enjoy it. And before I go, another shout-out to Rehan this time, he started the Buff Dudes workout and he's really enjoying it in his first week. That's another person who's started their fat loss journey and you could be there too. Go to Better4Fitness.com and check out what I'm doing. Have a good weekend, I'll see you on Monday, take care."